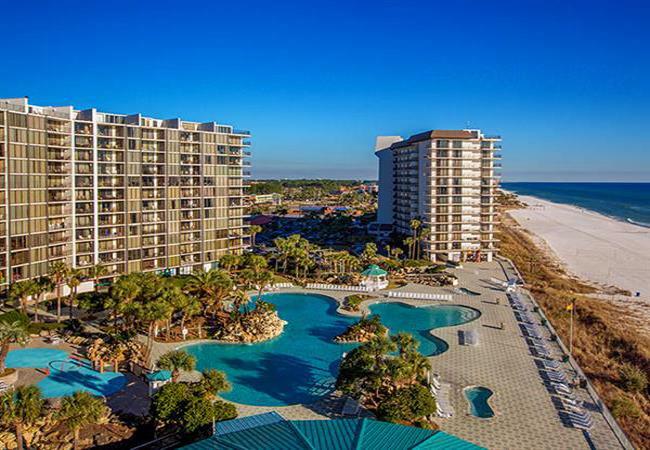 Located on a half mile of private beach, the Edgewater Resort (also known as the Edgewater Beach and Resort Club) stands out from all the other Panama City Beach vacation rentals. This full service resort provides guests with a multitude of experiences and amenities. Beginning with its 500 suites offering one, two or three bedrooms, guests can choose from Gulf-Front, Leeward and Windward Suites or Golf Villas. The ample selection means that everyone will find the perfect option at the Edgewater Resort. Gulf-Front Suites offer waterfront views. Suites in the Leeward and Windward towers provide a variety of floor plan options along with beautiful views of the Gulf of Mexico and some of the resort’s quiet pools. The Golf Villas, landscaped with wonderful, lush Florida greenery, are located near the tennis complex and offer views of the golf course. Each unit provides guests with a fully equipped kitchen containing dishes, pots, pans, a dishwasher, a microwave and a refrigerator. In addition, guests can enjoy using unit’s cable television and DVD player. A washer and dryer are also included. There is plenty to do outside this Panama City Beach resort, too. Choose from 11 different swimming pools including the 11,500 square foot Lagoon Pool that feels quite tropical with its waterfalls and islands. Forty-five thousand feet of sundeck space surrounds the Lagoon Pool providing plenty of room to put one’s feet up. With the exception of this main pool, all other pools are heated seasonally for guests’ enjoyment. Those wishing to soak in warmer water will love settling into one of the four whirlpool spas. Six reflecting ponds round out the water features. The half-mile of private beach stretches out directly in front of the property offering white sand and turquoise waters. Sunbathing and castle-building are encouraged. Those wishing to do more have access to a wide variety of experiences available for an extra fee. These include dolphin encounters, sailboat rides and rentals, banana boat rides, boogie boards, jet skis, beach chairs and umbrella rentals, surfing lessons, paddle boarding, kayak rentals, skim boarding and eco-tours. Finding food will never be a problem at this resort. With four on-site dining establishments, guests will never go hungry or thirsty. Ocean’s Bar & Grill sits alongside Blenders on the Lagoon Pool Deck. Both offer gulf-front views and delicious menu options. Families can also choose to eat at Paradise Pizza for more casual fare. Coffee lovers will delight in the Starbucks sold at Edgie’s Corner Market which also offers ice cream. Of course, room service is always available and there are many other restaurants nearby. Other on-site activities include a nine-hole golf course, ten all-weather Plexicushion tennis courts and a salon. The Edgewater Beach and Golf Resort in Panama City Beach is happy to offer lessons, equipment rentals and other services. Additional services such as airport transportation, room service, Kid’s Klub and massages are available for a fee. Be sure to check out this gem of gems found among Panama City Beach vacation rentals!